You won't find more practical baby baptism favors than these cute heart shape measuring spoons. They were designed as baby shower favors, but gained popularity for baptisms and christenings because they are so unique and useful. They also have messages of love on each one: "A pinch of joy", "A dash of tenderness", "A spoonful of affection" or "A heap of love" Think about all of the favors you have received at a baptism. Which ones did you keep? You can be sure that these measuring spoons will be saved and used. Measuring 5.25 x 2.25 inches, each set of four measuring spoons are made of stainless steel. Each has an accurate measure of a tablespoon, teaspoon, 1/2 teaspoon or 1/4 teaspoon. 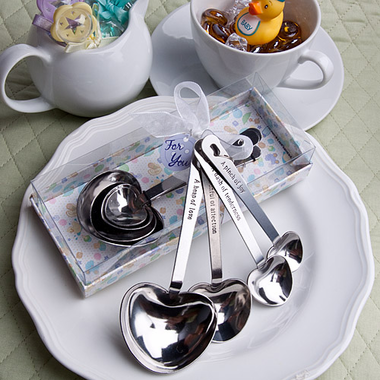 This set of four spoons comes packaged in a baby theme box with a display baby bottles, buttons, teddy bears, and a clear top.